I love the Emerald Envy colour! 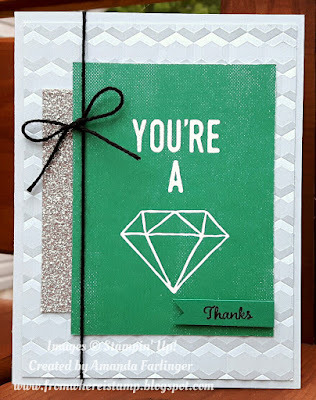 It matches so well with many of Stampin' Up! 's colours. It is a current In Color and will retire in May 2018!! I shared these cards at my Facebook party last Thursday evening. If you missed it but would love to see more inspiration please join me on Thursday August 10th from 8pm to 9:30pm on my Facebook page for my next Memories & More online party. Both of these cards feature a 3"x4" card from the Perfect Days Memories & More card pack. I used the One Big Meaning stamp set to turn them into Thank you cards!